Regardless of the reason for wanting a rapidly-growing tall hedge or privacy screen, we have excellent options for any space. These varieties will grow more than 1 foot per year (some can grow up to 4 feet per year in ideal conditions). They are all well-suited to hedging, so they can also be pruned to remain tight and kept at any desired height. Some are evergreen, some are deciduous. We’ve included detailed information on each with the best ways to use and maintain them. It is important to note that, although these varieties do grow fast when compared with some other types, a big factor in the growth rate is the environment. Trees and shrubs that are stressed from lack of water, extreme temperatures, or the wrong exposure (i.e. too much sun or too much shade), will grow much slower than the typical growth rates. 1. 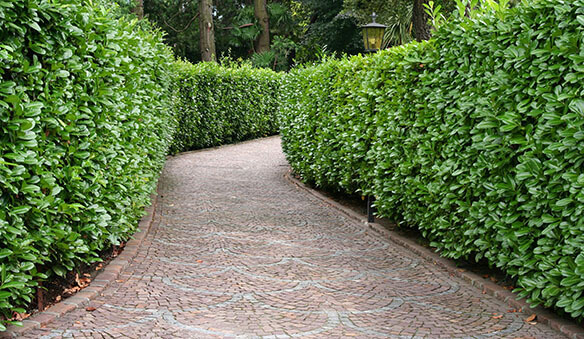 Choose the right hedge for the right space. If you don’t plant your hedge in the right site, it will never thrive. Full sun plants need to be planted in full sun. Plants that are borderline hardiness will be damaged each winter by frost. Water-loving varieties can’t be planted in deserts. Do your research before planting, choose a plant that suits your site, and you will be just fine. Keep in mind that a plant that tolerates both shade and sun will generally grow faster in more sun. 2. 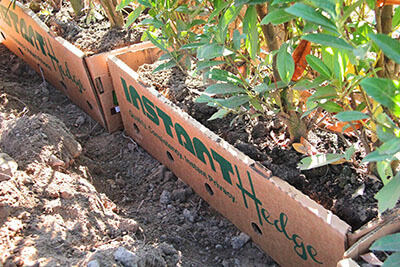 Plant your hedge at the right time. 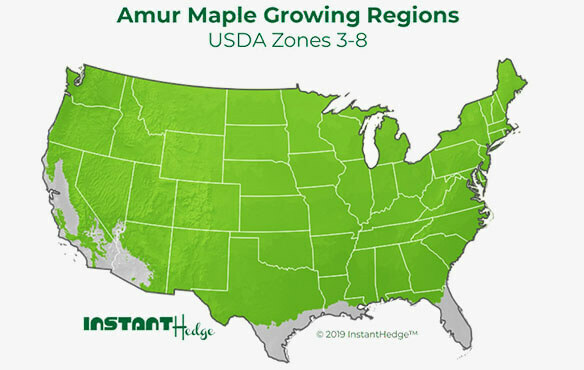 Planting an Amur Maple hedge in the middle of July in full sun with limited supplemental water is going to set the plants back significantly. The ideal time to plant is fall, after the hedges are dormant. You can also safely plant through the winter in areas where the ground does not freeze hard, and spring is also a good time. Doing this saves you work and worry and saves the plants a lot of stress. Once your hedge has been in the ground for several years and has had a chance to send roots deep into the soil, it will need very little supplemental water, if any. 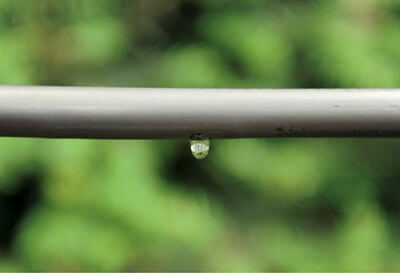 However, it is important to provide ample water during the first 1-2 growing seasons after planting. The best way to do this is to lay drip line along the length of your hedge and run for an hour at a time every few days to water deeply. Hedges are very low-maintenance, but if you want optimum growth, applying a high-nitrogen, slow-release fertilizer will help. It is best to apply in the spring right before growth begins. Spring is generally the best time to prune, as this stimulates new growth and ensures that no tender new shoots will be frozen if they emerge too close to winter. Yearly pruning, although it seems counterintuitive for a fast-growing hedge, really helps create a nice, dense hedge. You’ll be glad you did it! Visit our Blog for more Growing Guides! 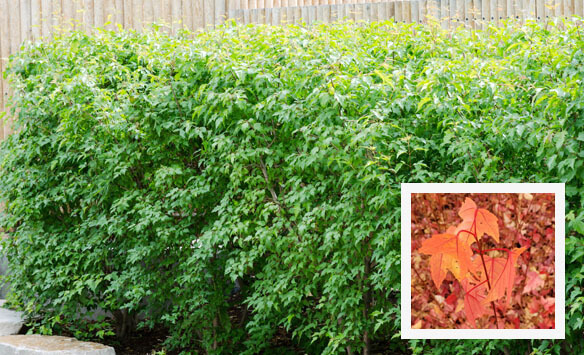 Flame Amur Maple is our favorite deciduous fast-growing hedge. It has outstanding fall color in fiery reds, oranges, and yellows. It is very cold-hardy (down to -40ºF!) and can be grown in most parts of the US. It can easily be grown as a hedge thanks to its multi-stemmed natural habit and can be maintained by pruning once per year. It thrives in full sun to part shade, and it is quite drought-tolerant once established. Flame Amur Maple makes a beautiful fast-growing screen that provides shade in the summer and still allows light through in the winter. 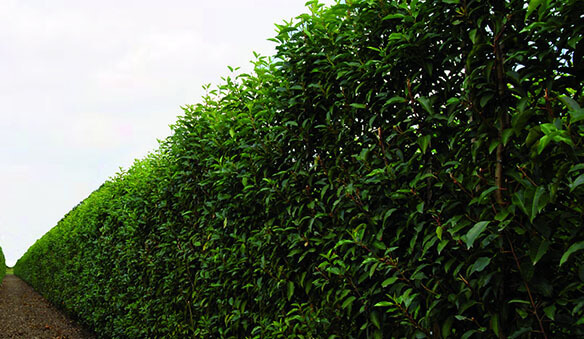 English laurel (or Cherry Laurel) can make an enormous fast-growing hedge. Under the right conditions, it can grow up to 3 feet per year! It does very well in heat. 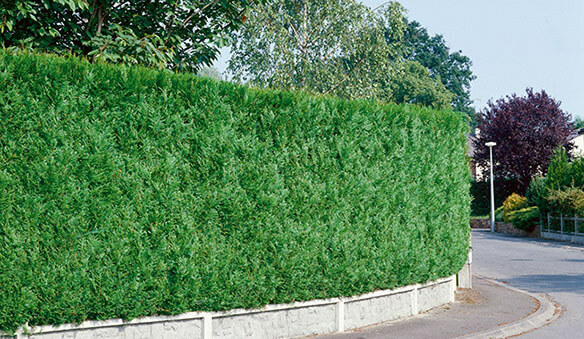 It has glossy evergreen foliage and makes a very attractive large hedge with regular pruning 1-2 times per year. English laurel grows in full sun to partial shade. 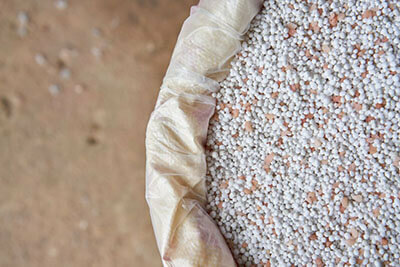 It tolerates a wide variety of soil types and is very drought-tolerant once established. It is smog and salt tolerant, and deer will not touch it. 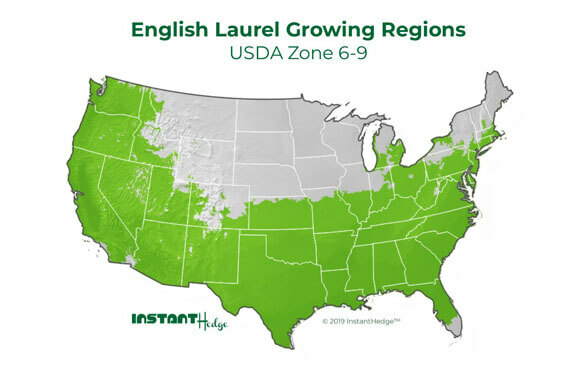 English laurel makes a tough-as-nails, versatile, and seriously fast-growing hedge. It’s perfect for large spaces where privacy is needed. Schip laurels (or Skip laurels) are a very popular shrub to use for an evergreen fast-growing hedge. They can easily make a tall and narrow hedge with pruning once per year and occasional shaping. It has the advantage over most other fast-growing hedge types of tolerating full sun to full shade. It also grows well in a wide variety of soil types, is drought-tolerant once established, and is not bothered by smog or salt. It does well in heat and is cold hardy to zone 6 or even warmer parts of zone 5. 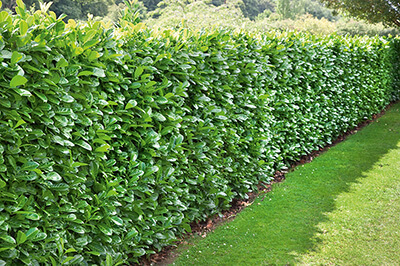 Schip laurel makes a durable fast-growing hedge that is ideal for privacy and for hiding fences. 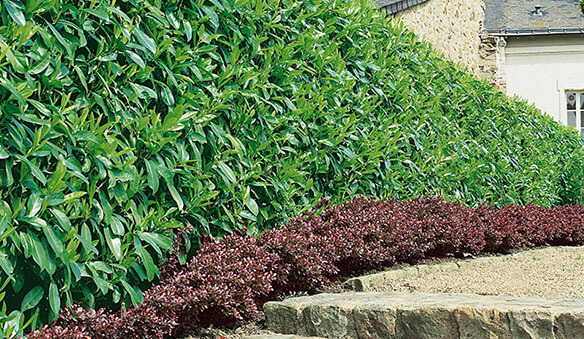 Portuguese laurel is a stunning fast-growing evergreen hedge that works well for warm, coastal regions. It grows quickly but is easy to maintain due to its mostly spreading habit. 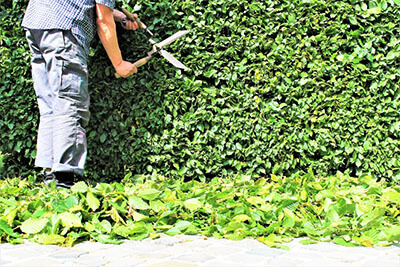 With pruning once per year, it quickly makes a very dense hedge. Portuguese laurel thrives in warm climates and does well in drought, smog, and salt. It grows in a wide range of soils, including poor soils. It is deer-resistant. It can take full sun and partial shade. 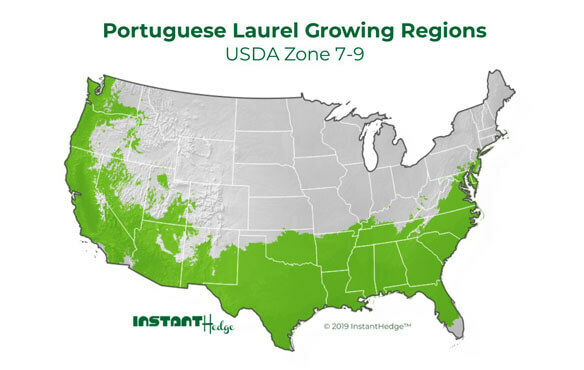 Though a little slower-growing than the English laurel or Schip laurel, Portuguese laurel makes an excellent fast-growing hedge with less maintenance required. 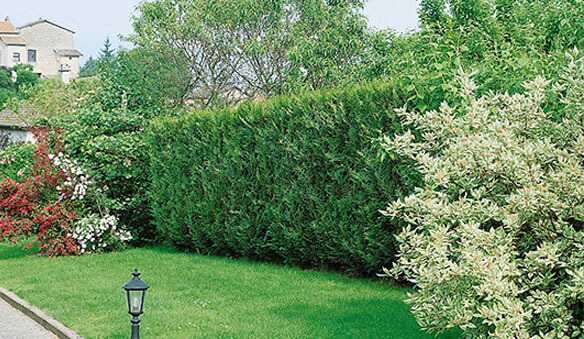 Its thickness makes it a great privacy hedge, wind-block, and noise-block. It is also perfect for hiding fences. 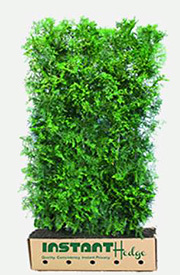 American Arborvitae is a popular plant for evergreen fast-growing hedges. It is extremely cold-hardy so it is especially useful in the Northern US. It is a quick grower but easy to maintain as a clipped hedge with one pruning per year. It is low-maintenance and fairly drought-tolerant once established. It does well in urban environments. Unfortunately, deer can be a problem. 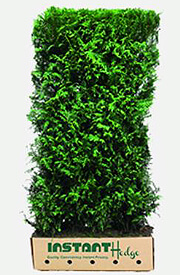 American Arborvitae make a wonderful, low-maintenance, evergreen, fast-growing hedge. It works especially well as a privacy hedge. Green Giant Arborvitae is the big exception to the rule that Arborvitae grow slowly. This hybrid Thuja typically grows 3 feet per year, with some reports circulating of it growing 5 feet in one year! 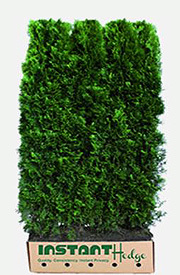 If you need a fast-growing, large, evergreen Arborvitae hedge, Green Giant is a perfect choice. It will take some work to maintain if you want to keep it as a medium-sized hedge, but one pruning per year will suffice for a large hedge. Green Giant grows in full sun to partial shade and is resistant to many diseases and pests, including deer. It tolerates many soils, but consistently damp and poor-draining sites should be avoided. It grows well in the humidity of the Southeastern US. 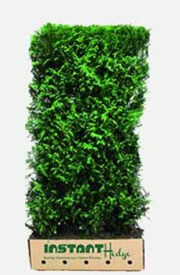 Green Giant Arborvitae is a classic fast-growing hedge. It is a popular choice for privacy and wind-breaks, and will remain healthy in many areas where other Arborvitae would struggle. Virescens Western Red Cedar is a wonderful fast-growing hedge for warmer regions where other Arborvitae might not thrive. It has a unique upright-branching habit and responds well to hedging. 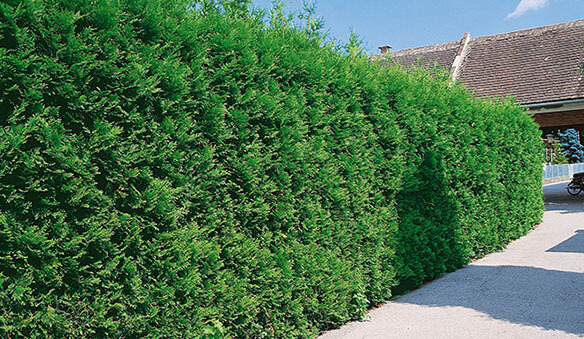 Virescens naturally grows tall and narrow, so it lends itself well to a tall privacy hedge. One pruning per year is sufficient to maintain a nice hedge. Native to the Pacific Northwest, Virescens does well everywhere that isn’t too hot or too cold. 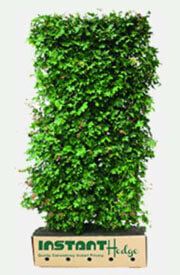 It tolerates partial shade as well as full sun, and it holds its green color all year. Deer leave it alone. Virescens Western Red Cedar is so well-suited to forming a fast-growing hedge that it requires very little maintenance. It makes a very handsome privacy hedge and hides fences well.